Just as I suspected, we skipped spring again, winter suddenly turned into summer. And due to this sudden change of temperature I felt so exhausted for two days that I couldn't get myself over here to write anything. 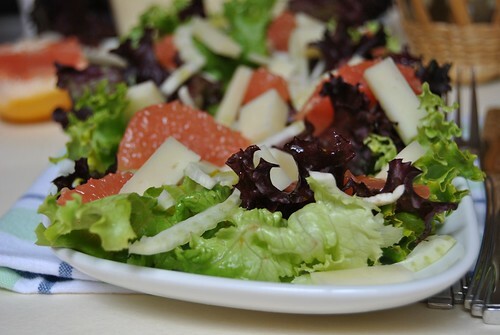 Today, I prepared this salad and it was so refreshing and tasteful. Asiago cheese is one of my favourites, soft and tasting like milk and butter, sweet and simply gorgeous. 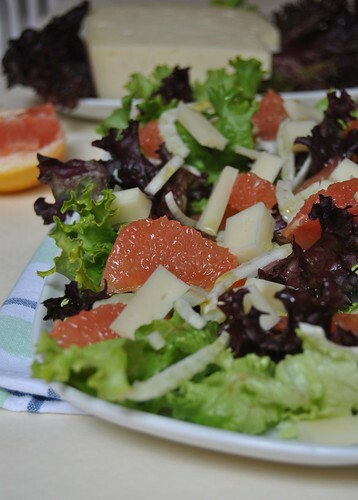 On the other hand, I love opposite flavors in my salads, so grapefruit was such a wonderful addition. I highly recommend you try this combination. Wash, dry and chop the latuce(I used two types, Red and Green Lollo latuce). Peel and segment the grapefruits (if you've never done this, here's a VIDEO you may find useful). Cut the cheese into cubes or sticks. Clean and slice thinly the fennel. Layer the ingredients on separate plates or in a large salad bowl. Season with EVOO, salt and pepper. Lavate a asciugate l'insalata (ho usato la Lollo verde e rossa) e tagliatela finemente. Pelate a vivo i pompelmi e ricavate dei spicchi privi di pellicina bianca (VIDEO). Tagliate il formaggio a cubetti o bastoncini. Lavate e tagliate il finocchio a fettine sottili. Componete l'insalata alternando gli ingredienti preparati e condite con olio, un pizzico di sale e pepe macinato al momento. Operite, posušite i nasjeckajte zelenu salatu (ja sam stavila dvije vrste, crvena i zelena Lollo salata). Ogulite grejpove i izvadite kriške bez bijele kožice (pogledajte VIDEO). Narežite sir na kockice ili štapiće. Komorač operite, očistite i narežite na tanke kriškice. Složite sve sastojke na pojedinačne tanjure ili u veću zdjelu i prelijte maslinovim uljem, posolite i dodajte svježe mljevenog papra po ukusu. I wish we could get to spring or summer here. It's been so cold and rainy! I love this salad. Grapefruit is one of my favorites! u r right its really difficult the sudden change of weather ..winter to summer. The combo between fresh cheese and fruit is just right for spring and summer. Thanks for sharing the recipe! Oh yap....right here! 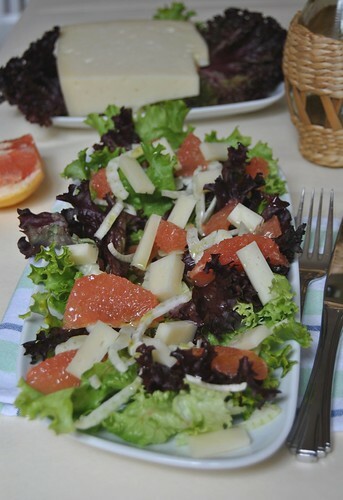 A very beautiful spring salad! Qui la primavera va e viene come le onde del mare; le temperature su e giù, maglione alternato a maglietta e io sono a pezzi!!!!!!! buonissime le insalatone in questo periodo! questa mi piace molto... grazie per il suggerimento!